Cyclists can transport their bicycles aboard Lafayette Transit in quality, heavy-duty racks attached to the front of each bus. 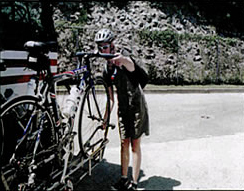 Cyclists can easily load and unload themselves by following the simple instructions affixed to the racks. The racks also have a locking mechanism to prevent bicycles from coming loose. For safety, buses have special mirrors that allow bus operators to see the bicycle racks and riders loading bicycles. There is no additional fee for riders to bring their bicycles on a bus or a railcar. Remove any loose or valuable items from the bicycle before the bus arrives. Make sure the bus has stopped and the driver sees you before you step in front of the bus. Squeeze the top handle and swing the rack down. 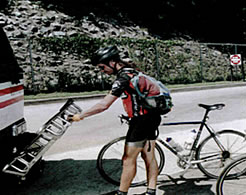 You only need to use one hand to unlatch and pull the rack down, so you can hold your bicycle with your other hand. It is not necessary to lean your bicycle against the bus. Lift your bicycle onto the rack, placing its wheels in the trough with the front wheel toward the spring-loaded bar. If a bicycle is already in the front trough, load yours in the rear trough facing the opposite direction. Raise the spring-loaded bar up and over the front tire and place it on the top of the tire near the bicycle's frame. The support arm adds lateral support for the bicycle when the bus is in motion and is required. The support arm needs to be raised so that the hook rests at the highest point on the front wheel. As you near your stop, remind the driver that you will be removing your bicycle. Lower the spring-loaded bar from the tire and lift your bicycle off the rack. Swing the rack up if it's empty. Go to the nearest curb. Wave to let the driver know you and your bicycle are clear of the bus.